Herman Miller Aeron Chair Review - Top Ergonomic Chair For Your Back? Herman Miller Aeron Chair Review - A Great Ergonomic Chair For Your Back? It has an iconic design that is famous the world over, but can the Herman Miller Aeron Chair stand up to all the high praise it gets? And is it any good for your back? ​You're probably already familiar with the Herman Miller Aeron chair even if you haven't heard the name before. This is because they are so popular and have been around for so long that you see them almost everywhere. So much so that when someone says 'ergonomic chair' to me, my mind immediately conjures up one of these. And if you're one of the lucky ones you may even have one at home or in your office already. Which is great because not only are they very nice to look at, they are also incredibly well designed and can be adjusted to the minutest detail to fit any individual perfectly. Which is such an important thing for people that suffer from back pain. Because these adjustments help to relieve the pressure and strain you get from sitting by encouraging you to sit with a healthy posture and keeping your core muscles active throughout the day. So why does the Herman Miller Aeron chair get so much attention? And is it the best bet for getting rid of back pain while sitting? Read on and find out the answers to those questions and more. Built in PostureFit sacro-lumbar support pads. Tilt mechanism with 4 lock positions. 8 zone pelicle mesh on back and seat to distribute pressure evenly. Tension of tilt mechanism can be adjusted to match your bodies movement. Tilt lock has 4 positions (neutral, engaged, mid- and full-recline). Seat angle has two adjustment levels (neutral and engaged). Two adjustable PostureFit pads to support the lower back and sacral regions. Fully adjustable arms that can be adjusted up, down, in, out, backwards and forwards. Curved design encourages you to adopt a natural and healthy posture. Able to be fine-tuned to the finest detail to ensure comfort and support. Pelicle mesh is breathable, keeping you cool and comfortable. It's also zoned so it's softer in places you don't need such firm support. Tilt mechanism allows your body to move naturally during the day, increasing comfort. You can also recline to relax and ease the pressure. Sitting in a generic, one size fits all type of office chair can cause big problems for your back. Because these office chairs generally offer zero lumbar support and make it nigh on impossible to maintain a healthy sitting posture. And this will only cause you pain and tension in the long run. Which is why investing in an ergonomic chair is such a good idea for people who suffer with back pain while they are sitting. As these make the best office chairs because they can be finely tuned to fit any individual. Which will encourage you to sit with a healthy posture, taking the pressure off your back, neck and shoulders. And when in comes to office chairs with great ergonomics and adjustable options, the Herman Miller Aeron chair is the daddy of them all. As it comes with the following features that can be fine-tuned to the most precise detail. Sit at a height that suits the desk or workstation you are using. Keep both feet placed comfortably on the floor while maintaining a 90 degree angle in your hips and knees. Fortunately the Herman Miller Aeron chair allows you to adjust the height of the seat easily. Simply use the paddle-shaped lever under the right hand side of the chair to activate the pneumatic lift and either raise or lower the seat to suit you. The seat angle can also be changed slightly to take some pressure off your thighs as you sit. There are two positions included with this chair; neutral and engaged. Neutral is the flat position that you will use when sitting upright or reclined. However you can also choose the engaged position which will tilt you forward slightly. And this can be handy for when you are typing away on the keyboard for an extended period of time. The Herman Miller Aeron chair comes with built-in support for your lower back in the shape of the PostureFit SL pads. One is to provide stability for your sacrum (base of your spine) while the other is to provide support for your lumbar region (lower back). And the good news is that these can be adjusted so you can position them exactly where you need them. Simply turning the relevant knob​ while sitting in the chair will either bring the PostureFit pads closer into your body or take them further away. And this also allows you to make slight adjustments depending on which sitting position and angle you choose. So you remain supported in every position. Which brings me on nicely to the tilt mechanism. As this controls the amount of resistance you feel when leaning back in the chair. And this is probably the best feature of the Herman Miller Aeron chair for your back, as it keeps you moving and your core muscles active and strong while you sit. You can adjust the tension of​ the tilt to make it harder or easier on your body depending on your needs and preferences. Neutral - This is the default setting and keeps you sitting in an upright 90 degree angle. Engaged - This allows you to tilt forward by 5 degrees. Mid-recline - This allows you to recline halfway back. Full- recline - This allows you to recline back to the maximum to fully relax. So you are fully supported no matter which angle you decide to sit in. Another important element of any ergonomic chair is the ability to adjust the armrests. This is because positioning the armrests at the right height and angle will greatly reduce the pressure and strain on your upper back, neck, and shoulders. You can adjust the height up or down to anywhere between 6.8" - 10.8" above the seat. Move them forwards or backwards by up to 2.5". Turn them inwards (up to 17.5 degrees) or outwards (up to 15 degrees). Which are all great features as you can then adjust the armrests to suit different tasks. Why Is This So Good For Your Back? Is this a regular occurrence on your current chair? A weakening of your spinal discs caused by compressed vertebrae. Your core muscles and the muscles that support your spine weakening due to a lack of activity. The build up of pressure and strain on your muscles and joints from sitting with a poor posture. And fortunately the Herman Miller Aeron chair addresses these problems. Which makes it a top choice for anyone who suffers from back pain while sitting. Bad posture equals back pain! The curved design of the Herman Miller Aeron chair is not just pleasing on the eye, it also plays a big part in helping you to relieve pressure as you sit. Because it's shaped in such a way that it encourages your body into a healthy posture as you sit by maintaining a natural 'S' shaped curve in your spine. And sitting with a healthy posture will mean that pressure is spread evenly throughout your body rather than building up in your lower back area. Another great feature in this chair are the PostureFit SL support pads. As not do they support and stabilise your lower back and sacral region while you sit. But by moving them into the correct position they also make it easy and natural to keep this healthy curve in your lower spine. Which also helps to relieve pressure. And another great way to support yourself and make sure pressure is spread evenly as you sit is to make sure both feet are placed on the floor. 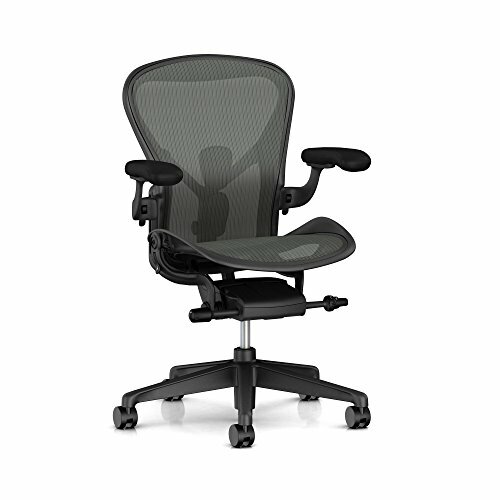 ​Which the Aeron chair makes easy to do with it's easily adjustable seat height. Then we come to the pelicle mesh that is used in the back and seat of the chair. This has been designed to have 8 different zones of varying tension, so you have all the support you need where you need it. The tilt mechanism is also good for pressure relief, as it allows you to change position and recline if you need to rest and take a break. And the adjustable armrests do a great job of releasing tension from your upper back, neck and shoulders. So as you can see the Herman Miller Aeron chair is great for relieving pressure, as it keeps you well balanced, supported, and in a good posture as you sit. You also need to keep your core and trunk muscles active as you sit if you want to avoid back pain. This is because they will weaken if you allow them to remain dormant as you sit. And as they are responsible for supporting your lower back and spine this is bad news! Because less support for your spine will only equal more pain in your back. But this is where the Herman Miller Aeron chair really comes into it's own for me. And it's able to do this because of the advanced tilt mechanism in the chair. As this allows you to rock back and forth in your chair and remains responsive every time you move. There's no room for them to become lazy in an Aeron chair! You can also adjust the tension of the tilt to make it harder or easier to lean back depending on how much of a workout you want to give your core​. ​And a stronger core will make a big difference to your sitting experience. So overall I'd say the Herman Miller Aeron chair is great for people with bad backs. As it does a good job of both relieving pressure and keeping your core muscles active throughout the day. Having a supportive chair is fantastic, but it's no use unless you can also feel comfortable while sitting in it. And while the Herman Miller Aeron chair is comfortable to sit in for most people, it may not be to everyone's tastes. As it may take some time to get used to. Because if you're used to sitting in padded chairs that allow you to slouch, the sensation of the supportive mesh and being thrust into a healthier sitting posture will feel strange at first. But once your body adapts you will never want to go back again. 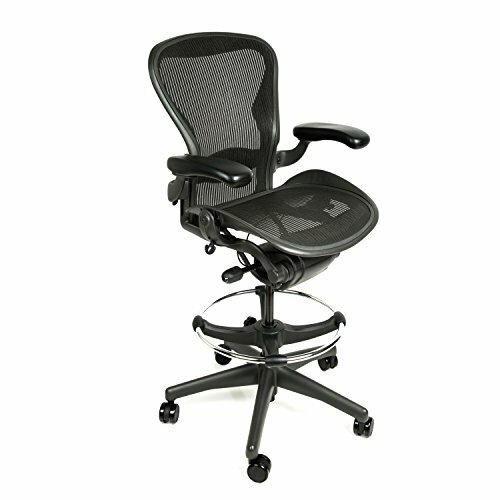 ​And the Aeron chair has lots of things going for it comfort wise too. Firstly the curved design and ergonomics allow you to sit ​with a comfortable and natural posture that takes away pressure and strain on your body. While the tilt mechanism allows you to move naturally throughout the day keeping you comfortable and relaxed. Also the tilt lock positions are great as they allow you to recline back and find a comfortable position to take a break in. Then there is the pelicle mesh in the back and seat of the chair which will divide opinion. Because as it's designed for support it may feel a bit too firm for some​ to sit in. However the 8 zones of varying tension means it's only firm where it needs to be and stays a bit softer in other areas to improve your comfort. And the big advantage this mesh has over padded chairs is it's breathable. Which means that air, heat, and moisture can pass through it as you sit. Keeping you cool and comfortable rather than becoming hot and sweaty, which can be a problem with leather or padded chairs. So while the Herman Miller Aeron chair isn't designed primarily for comfort, it still remains a comfortable chair once you get used to it. The Aeron chair comes in 3 different sizes depending on your height and weight, so you need to make sure you choose the right one to fit you. Size A - 25.75" wide, 38.5" high. Suitable for people between 4'10" - 5'9" and 90lbs - 150lbs. Size B - 27" wide, 41" high. Suitable for people between 5'2" - 6'6" and 130lbs - 325lbs. Size C - 28.25" wide, 43" high. Suitable for people between 5'3" - 6'6" and 180lbs - 350lbs. So if you're buying online your safest bet is a size B as this seems to fit most people. However it may be worth checking the sizes out for yourself at your local department store before ordering. And there are also different models of the Aeron chair available, as it went through a re-design in 2017 and the one I'm reviewing here is the latest model. However there are a few older versions that are still available and these are great office chairs too. Just make sure you are getting the one you think you are getting! And finally Herman Miller have just released a version of this chair for those that work at higher surfaces and workstations called the Herman Miller Aeron Stool. This is a great idea and has all the same features and benefits of a regular Aeron chair. Although it may be a bit extravagant if you only plan to use it at your breakfast bar! You don't need to pay full price. Now while I think the Herman Miller Aeron chair is a great chair and a very worthwhile purchase for anyone who suffers from back pain, there is one major drawback. And that is the price. Because as these are among the best office chairs they don't come cheap! ​But you do have options if you want an Aeron chair but also want to save some cash. Because as these chairs are so popular and have been around since 1994, there are plenty of places you can pick up used ones at a knockdown price. So keep your eyes peeled at second-hand furniture stores or yard sales. ​Buying from a company like this gives you more peace of mind and guarantees you are getting a quality product. However when buying a used Aeron chair just make sure you know what you are getting. As there are a few different models and some don't have certain features that may be important to you. But ask a few questions beforehand and this is a great way of getting your hands on a top quality chair at a bargain price! So back to my original question, which was does the Herman Miller Aeron chair live up to the hype? For me the answer is it definitely does, and I think this chair is especially good for those of us with back pain. As the ergonomic features are second to none and will really allow you to reduce the pressure on your body as you sit. Plus they make sitting with a healthy posture a doddle and have good built-in lumbar support which you can adjust to suit you. And while the pelicle mesh may feel a bit firm for some at first, once you get used to sitting on an Aeron it will feel really comfortable. 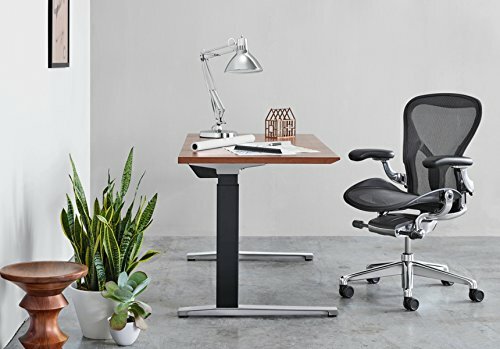 So if you're looking for an ergonomic chair to help reduce your back pain and want the very best around, the Herman Miller Aeron chair could be the one for you. Just be warned that they are not cheap and for that reason may not be the right chair for everyone. So if you only use your chair for a few hours per week then you can probably get away with a cheaper model instead. However if you use it every day then an Aeron chair is a great investment in your long-term health. And remember you can also pick these chairs up used or refurbished if you want to snag yourself a bargain. So give an Aeron chair a run out in your home or office. Not only will it look great, your back will feel much better from using it too. Can be finely-tuned to fit any individual. Tilt mechanism allows your body to move naturally, keeping your core muscles engaged. PostureFit LS pads support and stabilise your lower back and sacral areas. Adjustable arms take the strain off your upper back, neck and shoulders. Curved design makes it easy to maintain a healthy and natural posture. 8 zones of differing tension in the pelicle mesh on the back and seat means pressure is evenly distributed. The breathable mesh keeps you cool and comfortable. Built to last and comes with a 12-year warranty. New design as of 2017. It's iconic and will look great in your home or office. The pelicle mesh may feel a bit too firm for some.